This fundamental acrylic paint set is a strong selling art supply item in Chicago. This acrylic paint set includes basic acrylic painting techniques with three easy-to-follow beginning projects. Includes: six .75 oz. tubes of heavy body acrylic paint colors, one 2 oz. tube of titanium white, one 4 oz. jar of gloss medium and varnish, two brushes, a palette knife, an 8" x 10" canvas board and an acrylic painting instruction/project book. 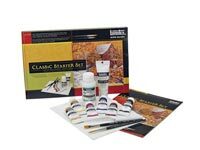 This set represents a necessary art supply for artists that wish to work on canvas, masonite, or other substrate with texture.